Recently comic artist and children's book illustrator Eric Orchard invited me over to his studio to try out his Cintiq. Talking with Eric is always a joy, and I headed over. 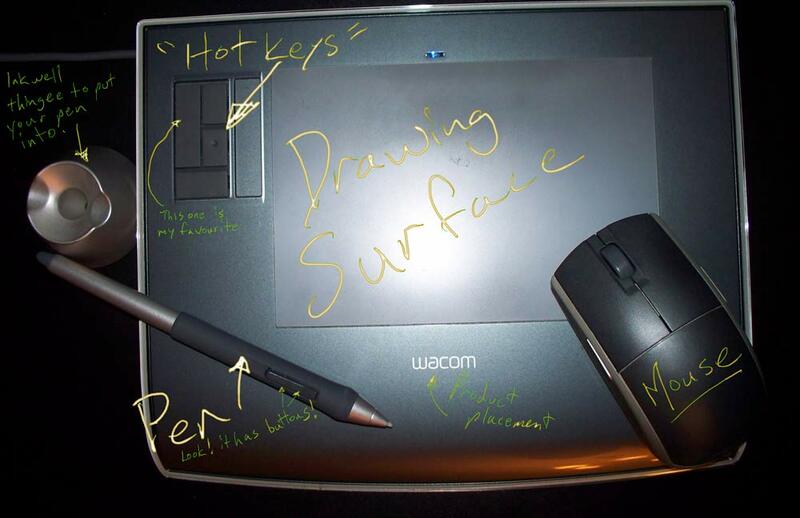 The Wacom Cintiq takes it one step further: you are actually drawing right on a pen-touch-sensitive computer monitor. Eric sat down to demo how it works, and with amazing speed whipped up an excellent little sketch. I realized how much I still hold back when using digital media: I have an oil painter's habitual sense of caution and planning. Eric made it look fun, almost breezy. Whenever I test out a new art medium, I sketch something I know. This was using Photoshop in black and white, without any zoom. I tried to test line widths and opacities to get a feel for it. It was completely fun. 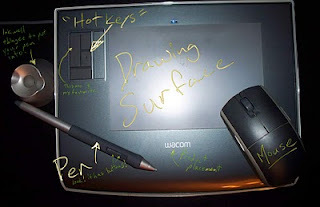 It felt like I was drawing right on a page, and I had to pay less attention to the interface than I do with my Intuos. One of the things I'm finding being in an at-home studio with a newborn in the house, is setting time to work in oil paint is difficult. Scrubbing my hands to pick up the baby is time-consuming, and I am jumping up and down. But working digitally, I can hold him in one arm if need be, or at least just dive back into the art project without the palette set-up. 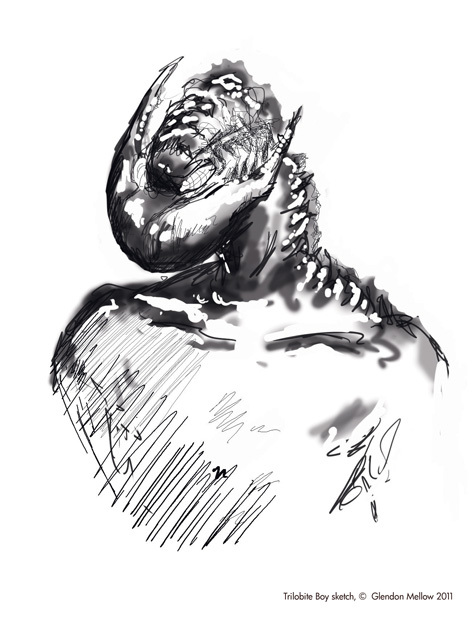 I will still happily take oil painting commissions, but I think for my own projects such as the Trilobite Boy comic, I will be working increasingly digitally. Thanks for the test drive, Eric! I've got to find a way to afford purchasing a Cintiq. Written by Glendon Mellow On March 21, 2011 In "Trilobite Boy", "digital", "meeting bloggers", "sketch", "tablet"